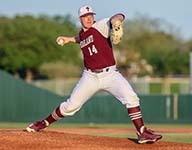 WINNING PITCHER - Pearland righthander Colby Casey got the job done on the hill as the Oilers blanked the Hastings Bears 10-0 to remain undefeated in District 23-6A action. PEARLAND — The Pearland Oilers are atop the District 23-6A leaderboard with a 6-0 mark and they look to complete a sweep in the first round pending their headon collision with co-leader George Ranch (5-0) on Tuesday (late). So far -- the Oilers have beaten every district foe in the opening round by large margins. They have wins over Alief Taylor (16-0), Dawson (12-7), Alief Elsik (19-0), Strake Jesuit (15-5), Alief Hastings (10-0), and Brazoswood (11-1). Pearland has outscored their district opponents 83-13 while posting three shutouts. Against Hastings, the game went only five innings due to the 10-run mercy rule. The Oilers scored a run in the first inning, two in the second, one in the third, and then blew the game open in the bottom of the four with six runs to make the score 10-0. Pearland blanked the Bears in the top of the fifth to see the game come to an end. Colby Casey picked up the win on the mound for the Oilers. Against Brazoswood, the Oilers blew out the Bucs on their own home field 11-1 as the usually traditional tough Bucs were no match for Pearland. The Oilers look to get past George Ranch and then begin the second half of district action on Friday, April 5 when they travel to face Alief Taylor at 7:00 p.m.
Pearland will host cross-town cousin Dawson on Tuesday, April 9 at 7:00 p.m.